Named after the area’s brilliant blue lupine flower, Blue Mountain is an unforgettable sight. 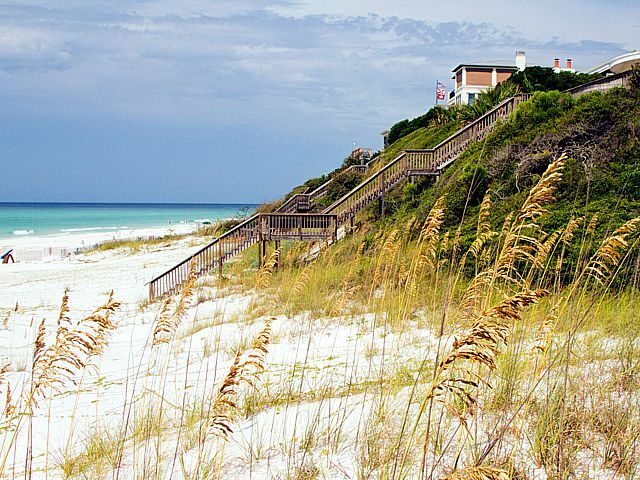 Enjoy gorgeous views of turquoise water from the top of this beach, which sits at a slight incline compared to the rest of South Walton. From cozy beach cottages to luxurious new homes, Blue Mountain offers a variety of accommodations for beach-goers to choose. Some people say the name came from a blue haze around the tall dunes; others credit the blue lupine wildflowers. Still others credit the view of the water from atop this village’s namesake, mountain-like dunes. Legend has it that pirates gave Blue Mountain its name when they spotted the beach’s tall dunes covered in Gulf Coast Lupine, a rare plant with blue flowers. Said to be the highest point on the Gulf of Mexico in the United States (a mammoth 64 ft of elevation), “Blue Mountain Beach” is hardly a mountain… but it’s 100% beach for sure! As for the blue? Folks say it likely originated from the blue lupine flowers that still flourish between the homes here. At one time, they blanketed these Gulf-side hills. With a laid-back vibe and only a few commercial businesses, visitors to this town will enjoy the abundance of outdoor activities available just minutes from your private home or beach condo in Blue Mountain Beach. Located within Blue Mountain Beach are three rare coastal dune lakes, Little Redfish Lake, Big Redfish Lake and Draper Lake – all great for fishing and kayaking. A few blocks up from the public beach access on South County Hwy 83 is a trail entrance into the Point Washington State Forest. If you follow the trail back you’ll encounter thick Cypress swamps, towering stands of Longleaf Pine, and large fields of wildflowers in the Spring and Fall. Food in Blue Mountain Beach is ample and full of personality. Stop by Johnny McTighes Irish Pub, hang with the locals, and see if you can catch a live lobster for your lunch in an unusual twist on the classic drop-claw game machine, or just sit back and enjoy a Guinness and a slice of homemade pizza. Right next door is a favorite for burgers and fried chicken – Sally’s By The Sea Store (in the front) and Redd’s Fueling Station (in the rear) for after hours food and fun. Just across the street is For the Health of It, a locally owned health food shop that specializes in organic produce, yummy smoothies and health supplements. Oh, and this is the place to go to find excellent massage (locals swear by it). Just down the street is the Justin Gaffrey Art Studio. Stop by for a visual treat and see work by the acclaimed artist. Just down the street from the studio, as you head west towards Gulf Place is Basmati’s Restaurant on Draper Lake, and Grecian Gardens, a great little spot to grab a Greek salad or a classic gyro. But don’t forget your bathing suit when you explore Blue Mountain Beach. The water is clear and cool, and the view of the “Blue Mountains” from the gulf is a site to be remembered long after your trip is done.